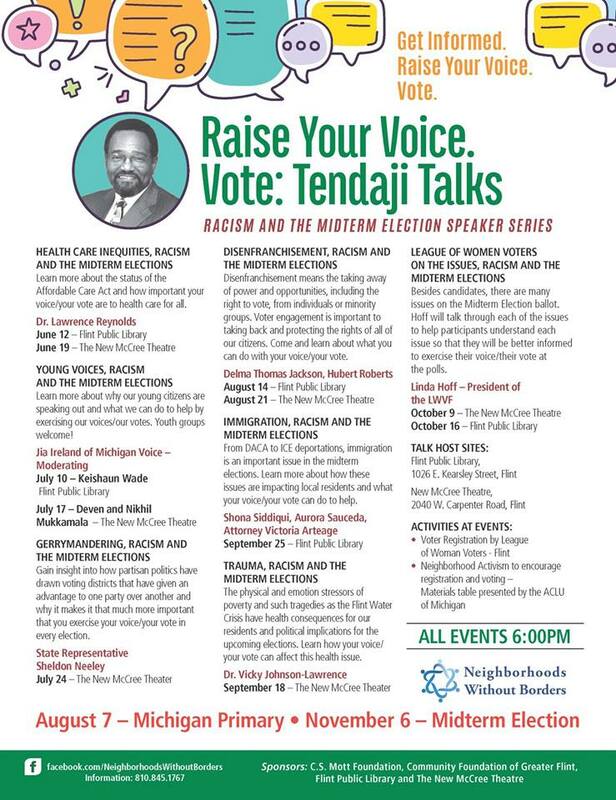 FLINT, MI — Racism, low-voter turnout and the midterm elections will be the focus of the Neighborhoods Without Borders 2018 Tendaji Talks series between June and October in anticipation of this year’s Michigan primaries and midterm elections. The series begins Tuesday, June 12 with a discussion on health care issues, including the affordable health care act and local health issues, with retired Hurley pediatrician Dr. Lawrence Reynolds. Reynolds will talk at the Flint Library beginning at 6 p.m. and a repeat discussion will be held at the New McCree Theatre, June 19 at 6 p.m.
All events are free and open to the public and begin at 6 p.m.
Disenfranchisement, gerrymandering, immigration, youth voices, trauma and ballot issues will be discussed over the coming months. All of the discussions will also include voter registration sponsored by the Flint League of Women Voters and “get out the vote” materials and advice from the ACLU of Michigan. 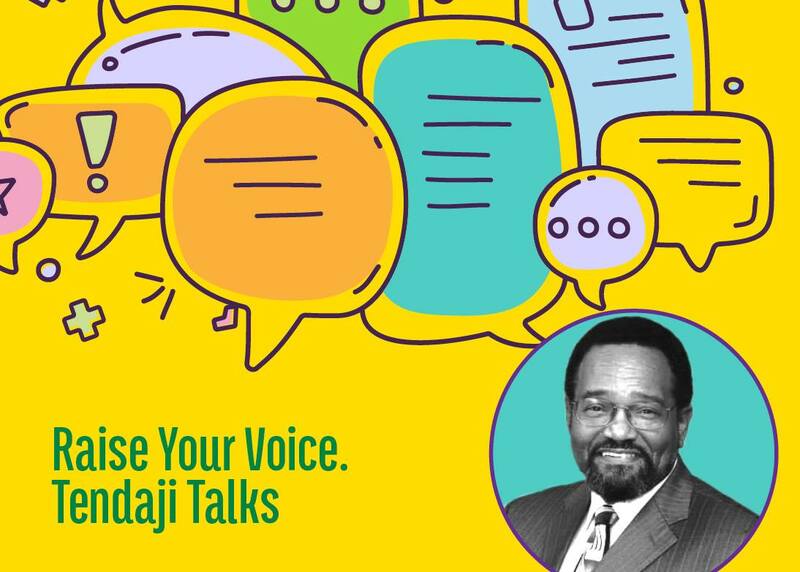 The Tendaji Talks honors the memory of Flint educator and community activist Tendaji Ganges who died in 2015. The complete schedule is available at the Flint Public Library’s website here or by visiting Neighborhood Without Borders’ Facebook page here. People can also contact Donna Ullrich at dullrich@umflint.edu and at (810)-766-6679 for more information. 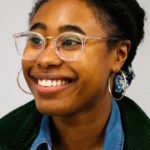 Organizers are set to hold several discussions on Healthcare inequities, racism and midterm elections during a speaker series honoring former educator Tendaji Ganges who died in 2015. See the schedule starting June 2018 below. Learn more about the status of Affordable Care Act and how important your voice/your vote are to health care for all. Learn more about why our young citizens are speaking out and what we can do to help by exercising our voices/our votes. Youth groups welcome! Gain insight into how partisan politics have drawn voting districts that have given an advantage to one party over another and why it makes it that much more important that you exercise your voice/your vote in every election. Disenfranchisement means the taking away of power and opportunities, including the right to vote, from individuals or minority groups. Voter engagement is important to taking back and protecting the rights of all of our citizens. Come and learn about what you can do with your voice/your vote. From DACA to ICE deportations, immigration is an important issue in the midterm elections. Learn more about how these issues are impacting local residents and what your voice/your vote can do to help. The physical and emotional stressers of poverty and such tragedies as the Flint Water Crises have health consequences for our residents and political implications for the upcoming elections. Learn how your voice/your vote can affect this health issue. Besides candidates, there are many issues on the Midterm Election ballot. Hoff will talk through each of the issues to help participants understand each issue so that they will be better informed to exercise their voice/their vote at the polls.